Player-exclusive shoes are typically worn by NBA stars, but STACK rounded up the best non-hoops PEs. Check them out. Kansas City Royals pitcher Jeremy Guthrie wearing Nike Foamposite baseball cleats. If it seems like NBA players wear a different pair of shoes every night, it's probably because they do. Over the past decade, the basketball hardwood has morphed into a runway, with players using the tipoff to show off their player exclusive (PE) shoes, which will never be released in stores. The PE trend has extended beyond basketball, with brands like Air Jordan, adidas and Under Armour supplying athletes with kicks that feature colorways and inner workings you'll never be able to buy for yourself. There are almost too many to count, but we've rounded up some of the best non-basketball PEs we could find. Enjoy. The newest member of the Jordan Brand endorsement stable is young Manny Machado, the Baltimore Orioles All-Star third baseman. Machado showed off a slew of Air Jordan VI PEs, three of which are actual baseball cleats (the other is a turf shoe). All three feature a combination of black and orange on the upper, representing the Orioles' colors. Los Angeles Dodgers infielder Juan Uribe got his hands on an exclusive all-blue (with a little bit of red on the tongue) pair of Air Jordan VIs, which the brand was kind enough to turn into a turf trainer. Houston outfielder Dexter Fowler rocked these Astros-themed LeBron XIs last week during batting practice. He even had his number stitched into the inside of the tongue. The king of baseball cleat PEs might be Kansas City Royals pitcher Jeremy Guthrie, who has a long history of rocking classic sneakers with spikes attached to them out on the mound. Two of his best are black and orange Air Jordan 1's (pictured above), which Guthrie sported when he played in Baltimore, and royal blue Nike Foamposites (pictured below). Guthrie was the first player to wear Foams on the baseball field. Golfer Keegan Bradley busted out these elephant print Air Jordan golf shoes at last year's Presidents Cup. The shoe looks eerily similar to the Air Jordan XX9 that was just recently announced. Either way, Bradley had by far the most stylish shoes at the tournament. The Air Jordan XX8 is already an outrageous looking shoe. Turn it into a football cleat and you'll really turn heads. San Francisco 49ers wide receiver Michael Crabtree was given his own special pair of XX8s, which featured a Velcro strap across the top and a zipper down the side, uncovering the secondary shoe inside. Crabtree broke out the cleats against the Green Bay Packers in last season's NFL playoffs. Fresh. A shout-out to all the moms out there. adidas gave RGIII a Mother's Day colorway of his brand new signature cleat, featuring a little bit of pink on the heel and part of the upper. 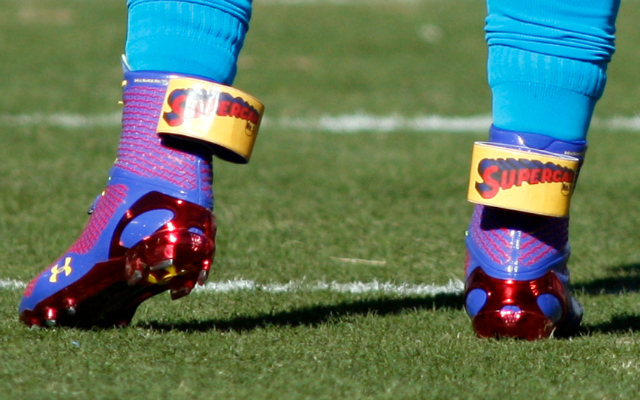 Mr. Newton has had fun with superhero shoes in the past, sporting both Superman and Batman versions of his Under Armour Cam Highlight football cleat. But his best player exclusive came in the form of a lime green and purple "Hulk" cleat, which Newton wore toward the end of the 2013 season. You wouldn't like Cam when he's angry.